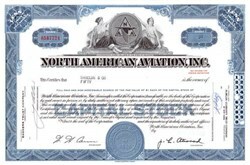 Beautifully engraved Certificate from the North American Aviation issued in the 1960's. This historic document was printed by the Jeffries Banknote Company and has an ornate border around it with a vignette of two women flanking the company's logo. This item has the printed signatures of the company's officers and is over 35 years old. 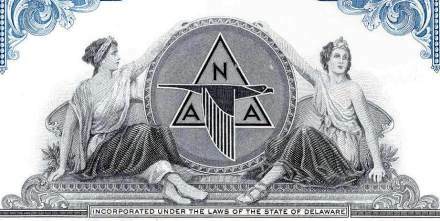 North American Aviation was a major contributor during WWII and afterwards. They were primary contractors on the P 51 Mustang, the B 25 Mitchell, the F 86 Sabre, and the SNJ/T 6 Texan to name a few.